Item # 315534 Stash Points: 395 (?) This is the number of points you get in The Zumiez Stash for purchasing this item. Stash points are redeemable for exclusive rewards only available to Zumiez Stash members. To redeem your points check out the rewards catalog on thestash.zumiez.com. Let people know about all your odd skills with the Samborghini Weird Flex Sticker. 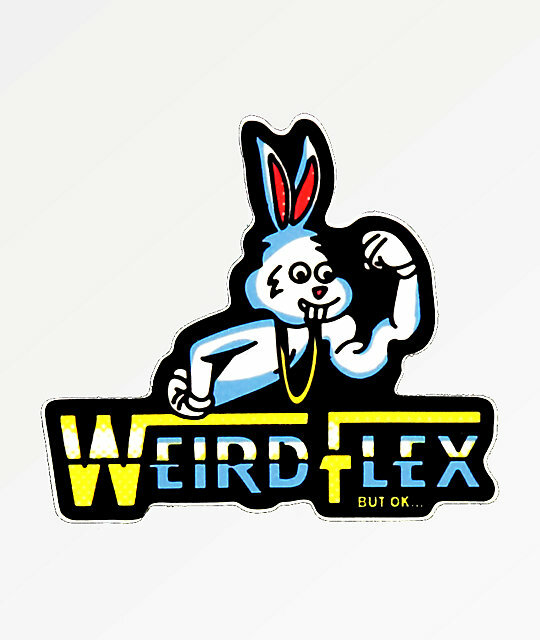 This sticker features the graphic of a rabbit attempting to flex it's arm with script below that says "weird flex" for a fun and humorous look. Weird Flex Sticker from Samborghini. Flexing bunny graphic with script detailing below. 3" x 3" | 7.5cm x 7.5cm (approx. ).